So many of the admirers of our carpet bags are also admirers of the beautiful aesthetic of Persian carpets, and why wouldn’t they be? After all, the fabrics that we use for our carpet bags largely imitate old Persian silk rug designs. However, we are far from the only people to have made Persian carpet bags down the years. 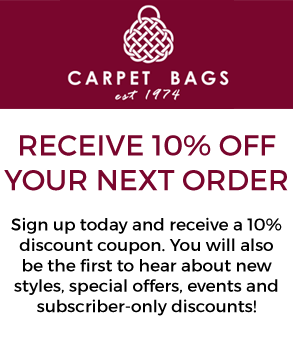 Carpet bags have long been made from oriental rugs, and we are only too proud to help preserve some of this tradition. We all seem to instantly recognise a Persian rug when we see one, and many of us have long swooned at such carpets’ beautifully intricate designs and means of construction. The skills required to make Persian carpets have been passed on through periods of peace, invasion and war, and have been around since at least the time of Cyrus the Great. The legend is that on conquering Babylon in 539 BC, he was wooed by its splendour and went on to introduce the art of carpet making to Persia. Persian carpets have been progressively refined over the centuries, but when the Safavid dynasty during which it reached its peak collapsed in 1722, the tradition could have been largely lost to history. However, towards the end of the 19th century, carpet making in the region once again flourished. With the carpet bag also seeing popularisation at around this time as a form of luggage in Europe and the United States... well, you only need to put ‘two and two’ together to get a sense of what happened next! We’re doing our bit to keep the tradition alive! As you can see from a quick glance at our many currently available carpet bag swatches, we have certainly not forgotten the aesthetic of Persian rugs, even if the way we make our carpet bags may not be exactly the same as was the case for the carpet bags of the distant past. Nonetheless, our carpet bags continue to be handmade and incorporate the intricate design of each carpet. They are made of cotton with 100% viscose pile, which gives them a wonderfully silky sheen while also ensuring both durability and lightness. They also now take an incredibly wide range of practical forms, from tote bags and shoulder bags to framed bags and satchels. In short, while Persian carpet bags may have evolved to fit the ‘mores of the moment’, they continue to preserve the aesthetic and spirit of many of the earliest carpet bags, and we couldn’t be more delighted to create and offer them to you. Why hesitate to purchase yours? Enough about carpet bags... what’s the story of Carpet Bags? What should women’s tote bags be about?